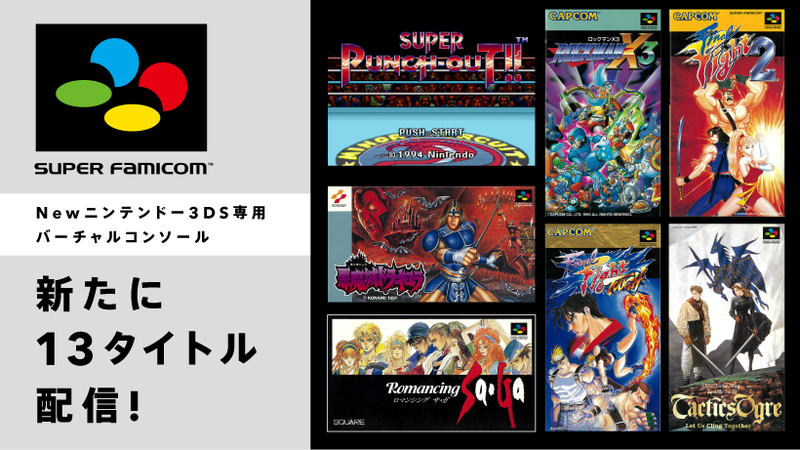 Seven Super Famicom titles (SNES to you and me) are launching on the New 3DS in Japan this week. The games are Final Fight 2, Final Fight Tough / Final Fight 3, Tactics Ogre, Rockman X3 / Mega Man X3, Romancing SaGa, Super Castlevania IV / Akumajō Dracula and Super Punch Out. 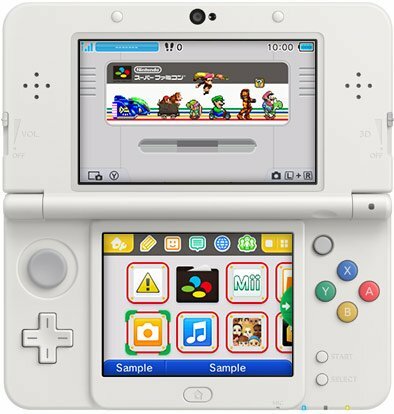 Furthermore, if you purchase one of these then you'll be entitled to the free 3DS theme shown below. The promotion runs until December 5th and a valid Japanese My Nintendo account is required to receive the code for the theme. Do you have a Japanese 3DS? Will you be downloading any of the games listed above? Let us know with a comment. @Shiryu I don't know what it is . . BUT I WANT TO PLAY TACTICS OGRE! They just need to release the Squaresoft and the Enix RPGs on N3DS already, they're killing me without them. Tactics Ogre PLEASE - NA!!! correction to the story: you can buy ANY SFC game on 3DS to get the theme not just one of the new games. @Shiryu My reaction as well. Oh man, hoping to get Tactics Ogre in the US in the future! Also, maybe they will release more snes games on the new 3ds, I hope so. Surprise to see Super Punch-Out!! on there considering the game was never released for the Super Famicom. If Japan got a western title (Super Punch-Out!!) then we need Tactics Ogre over here. Tactics Ogre is for those that don't know the basis for Final Fantasy Tactics. Nice! It was looking to me like Nintendo was quietly taking the first steps towards abandoning VC support on the N3DS, just as they did with the original 3DS. I'm glad to see that isn't the case (for now). 1). Square got their start with Nintendo. 2). Their support of PS3, PS4, and even the PSP made sense. The fact that there are more SNES RPG's available for Vita, a system that has sold TERRIBLY, than there are for 3DS/N3DS doesn't make any sense at all to me! Thats a great review of Tactics Ogre. Well done! @TossedLlama Thanks, there really is nothign else to say, I can't fault this game at the time it was released, its peak performance for a the SNES in every way. Reggie could learn a thing or two from this. This is how VC games should be released; in batches of multiple games, not just a single game every other week, if even that! @Frosty_09 Yes, the PSP port is the definitive edition and despite keeping the original graphics, the widescreen aspect is a welcome addition. Go for that one because we will never get the Super Famicom version released officially in the West. 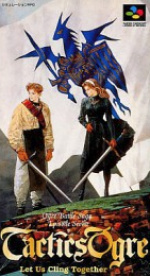 I sadly never completed "Tactics Ogre: Knights of Lodis" having opted to get "Final Fantasy Tactics" at the time instead. It has its fans, but a lot of people disliked it for some reason and consider the weakest game in the whole series. I would actually pay money for a Super Famicom theme for the 3DS. No doubt if we get anything it will be some nasty PAL themed skin, just like those terrible PAL MegaDrive and Dreamcast themes. Super Famicom Wars was another major exclusive. A few of the late Japanese retail releases were also first released through the Nintendo Power system. Got em all on 3DS VC already. @Frosty_09 The GBA tile is definitely a dividing one, but I am glad you are enjoying it.